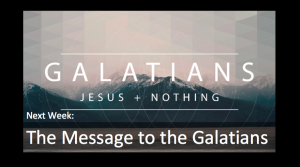 This week we will continue our series on Paul’s letter the Galatians. It becomes very clear that Paul is very concerned for the people he had ministered to in Galatia (Acts 14). He begins by reminding them of the message he gave to them and why it is so important. Tuesday, April 2nd from 7:00-8:30pm at the Haupt’s house (1317 Conrad Lane). Do you need prayer? Our prayer ministry wants to pray for you! Look for Prayer Request cards by the offering basket. Fill one out and put it in the offering basket– or find the prayer table after the service and pray with someone.